International Journal of Research in Health Sciences,2014,2,4,1009-1013. 1,4Assistant Professor. 5-Senior Resident, Department of Anesthesiology and Critical Care. SCB Medical college hospital. Cuttack, Odisha, INDIA. Introduction: Endotracheal intubation may create a period of hemodynamic instability in normotensive patients but more so in hypertensive patients. Endotracheal intubation produces stimulation of laryngeal and tracheal sensory receptors, resulting in a marked increase in the elaboration of sympathetic amines leading to hypertensive crisis. Objectives: The objective of study is to evaluate and compare the efficacy of fentanyl and fentanyl plus lidocaine in attenuating the stress responses to laryngoscopy and endotracheal intubation in hypertensive patients. Material and Methods: We conducted a prospective, randomized, double-blind study in 40 patients with controlled hypertension. All patients were randomly divided into two groups (fentanyl group and fentanyl plus lidocaine group). 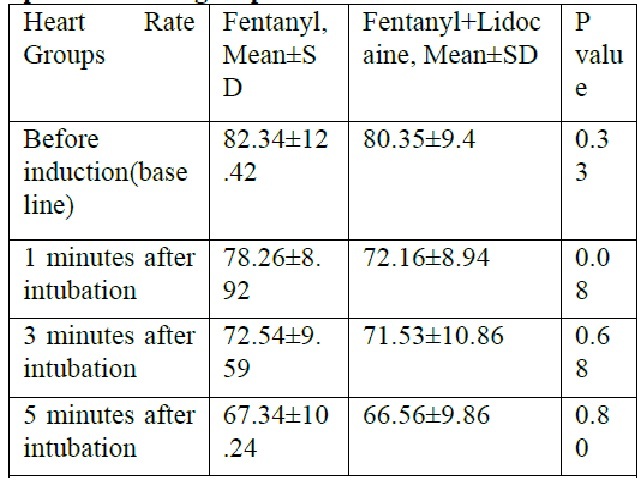 The fentanyl group received 2 mcg/kg and the fentanyl plus lidocaine group received 1.5mg/kg lidocaine and fentanyl 2mcg/kg, 3 min prior to intubation. Hemodynamic parameters were recorded at baseline, after giving induction agents, and 1, 3 and 5 minutes after endotracheal intubation. Results: There were no significant differences between the two groups regarding hemodynamic parameters like heart rate, systolic blood pressure and diastolic blood pressure before induction 1, 3 and 5 minutes after intubation. Conclusion: Both fentanyl and fentanyl plus lidocaine effectively decreased the stress response to endotracheal intubation.